Search Category Leave category selection blank to search within all categories. AJ2 is the abbreviation for "Adventurer's Journal v2". It is a utility program for Dwarf Fortress. 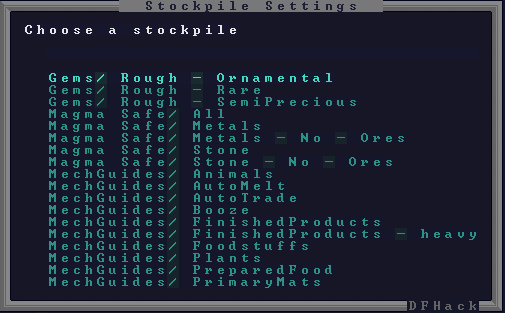 Adventurer's Journal is a dedicated utility to guide Dwarf Fortress players when they are playing adventure mode. Legends Browser is an multi-platform, open source, java-based legends viewer for dwarf fortress 0.44. Populate.rb allows you to modify the populations of world regions, world locations, sites, and civilizations. Simple Lua script for DFHack to stop immigrant arrivals. It should not conflict with migrants-now. Simply add "migrants-never start" to your onLoad.init to enable it. Nobody on the DFHack team accepts any responsibility for anything that this program causes. It is liable to be very unstable. menu-mouse is a utility that adds mouse support to menus and lists in Dwarf Fortress. Changes the camera to one that can be moved around a little. Todo: be able to switch between the two. Dwarf Fortress 0.40.24, with DFHack R2 installed. Custom item descriptions with ASCII images! Lets you manually assign new spouses for your dwarves or remove existing romantic relationships (useful when the spouse is dead). Also shows pregnancy info. Unzip the file and place the 'stocksettings' folder in your DF folder. See forum thread for details. This is a utility for viewing the detailed maps exported from legends mode in a more user friendly format. This build should work with DF's included libs/libstdc++.so.6. Built for older Linux versions, in case the official package throws GLIBCXX_3.4.20 and CXXABI_1.3.8 errors. This is a DFhack lua script to fix sterility in animals that won't breed. It currently works with DFHack 40.12 r1. Another random creature creation script. DFHack for Dwarf Fortress 0.40.10 on older Linux machines. dfstatus is a dfhack lua script that gives you a quick glace at some of the more important commodities in the game. See forum thread for readme. Use this if the newer GCC version doesn't work for you. Install by unpacking directly into the df_linux folder. See forum post for readme. A DFHack plugin for making all kinds of automatic machinery. This should be considered extremely unstable and you shouldn't download it unless you want to beta test it and have your saves backed up. Multitouch (two-finger) map scrolling with touchpad or Magic Mouse on OS X. Early attempt at a stonesense-DF overlay. Not completely stable. Many features not yet implemented. Intended for testing and feedback purposes. A DFHack plugin that allows dwarves to emigrate from the fortress if their mood is low enough. Contains the plugins for both linux and windows. Install to df/hack/plugins. Type help diggingInvaders for usage. This project has been moved to GitHub. A dfhack plugin that messes with rendering. User friendly script that creates slab made of selected material and engraves it with text you enter. Perfect for community games. This is a DFHACK script that lets you modify the skill level of your dwarves. It is intended for scientific purpose. Save the file "skill.lua" in your "/hack/script/" folder. See forum thread and readme for details. These are scripts that attempt to expand raw modding a bit. A script that allows modders to apply syndromes to creatures who are wielding items. this is a (compiled for windows) plugin version of the fix for the growth/size bug. Uses a lua viewscreen to display information about a unit's age, birth day, life expectancy, shearing products, milking products, grazing value, Egg laying, body size, and death info. Implements my proposal from the "Manager Auto-fills stockpiles" thread, currently the top-rated Eternal Suggestion. This is a front-end for the dfhack plugin autobutcher to make management of the watchlist more convenient. A plugin for DFHack 0.34.11-r2. Allows creation of new z-levels in fort mode. Optionally creates new z-levels as you construct upward. Linux StoneSense and DFHack for use with the Mojosetup Linux installer. A Runesmith like utility for changing dwarf skills. See the forum topic for more details. Is a customizable control center to launch Dwarf Fortress and related utilities. A small program that shows how mineral-rich your embark site is. A DFHack-based tool for operating on groups of map tiles. Added v (vein info) command. Added Z (select entire Z-level) command. heh sorry couldn't help it. Also included easy destroy mode batch file. Miss bottomless pits and chasms? Need some way to get rid of magma-safe items? Simple utility to fix the annoyances caused by the new channeling functionality. There is a newer version of Overseer here! More information on the bay12 forums here: http://www.bay12forums.com/smf/index.php?topic=63484. Works with all linux versions 40d2-d19! Works with all windows versions 39a-40d and 40d2-40d19! Converts all of your mechanisms to bauxite, so you can use them safely in magma. Uses DFHack, which you will need if you want to compile the included source code. Currently only works with 40d16! In addition to the current 0.4.2 features of Dwarf Therapist, this version adds the following features.